I’m recovering from bronchitis and a head cold—you know how nasty San Diego winters are. I don’t have my books here with me today, so I’m sending you a lovely photo my husband brought back from his lunchtime trip to his favorite taco truck. Apparently, they are proudly displaying new signs, but they didn’t ask the Editrix for any help. 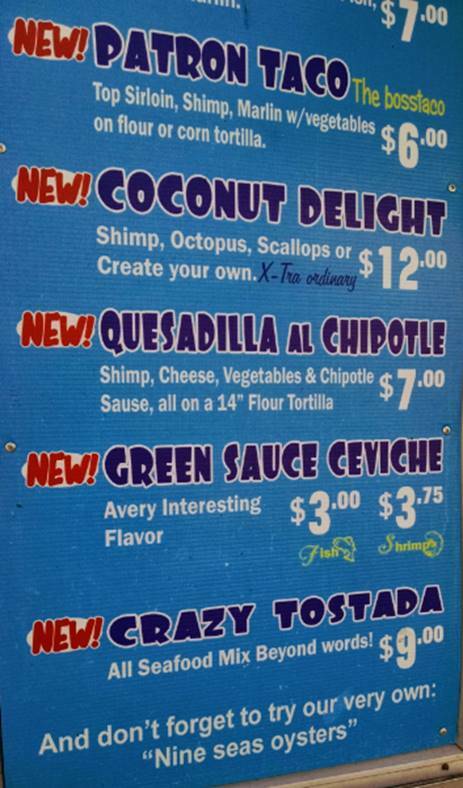 I think my favorite part is the $12.00 Coconut Delight, which promises to be X-Tra ordinary. Outside of this error, I spy capital letters a-go-go, spelling problems, punctuation errors, and more. If you can find at least 10 errors, I suggest you stop at the 9 Seas taco truck on 30th and Grape St. and offer your editing services.